Minor League Baseball Back at Wrigley Field | Have Game? Will Travel! For the past three seasons, the Chicago Cubs have hosted a minor league game at Wrigley Field. I attended the game two years ago, but missed last year’s game since I was in San Francisco. Tonight the Peoria Chiefs hosted the Kane County Cougars in a rematch of the game played two years ago at Wrigley. 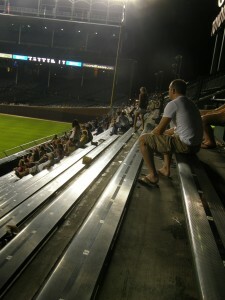 The minor league game is an excellent way to experience Wrigley Field as the crowd is sparse – tonight’s game only drew 8,994 fans. That number is way down from the 32,103 who showed up two years ago. A few days before the game I read that hot dogs would cost $2 and beers $3.50 in the bleachers (minor league pricing for a minor league game). I always like sitting in the bleachers (unless it is hot out) as it is the closest gate to my house and especially when it will not be crowded. Thus, I bought a ticket from the box office for $10 (cheapest tickets were $5 for the upper deck). Since there weren’t many people in the bleachers I finally noticed that the bleacher seats in “upper level” are different from the lower bleacher seats – due to the bleacher expansion. In a rain soaked game, the Chiefs defeated the Cougars 5-2. Jae-Hoon Ha hit the Chiefs third home run at Wrigley Field (they hit two home runs in the 2008 game). Rain has been a constant theme for these two teams at Wrigley Field. In 2008, the game was suspended in the 9th inning when the game was tied 6-6. That game was completed in Peoria the next day – probably one of the rare games that took place in two different ballparks.